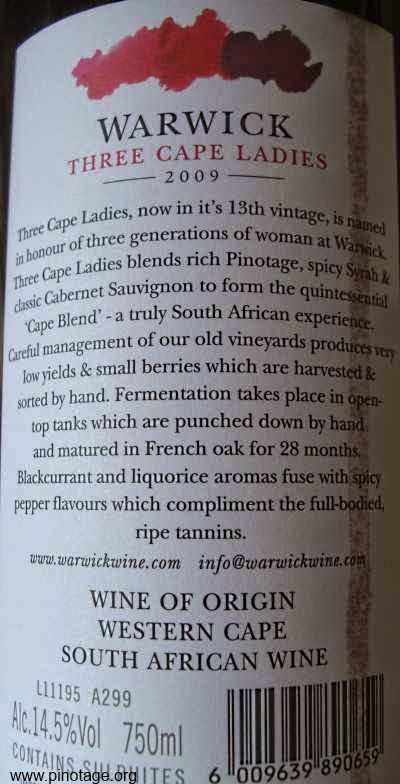 My Wine of the Month for March is Warwick’s ‘Three Cape Ladies’ 2009. This is a Cape Blend, a wine where South Africa’s Pinotage shares space with international varieties, here Cabernet Sauvignon and Shiraz. Having spent last week in Bordeaux drinking blends of varying proportions of Merlot, Cabernet Sauvignon, Cabernet Franc, Malbec and Petite Verdot I found The Cape Ladies most impressive, lacking the leanness of Bordeaux. 2009 vintage was exceptionally good in the Cape; this wine is lush and ripe, well balanced with that seam of sweetness that Pinotage adds to blends. This 2009 is fully mature with its colour darkening but maybe that’s because I didn’t keep this bottle in cool enough conditions. Ah, the blend…. The rear label lists Pinotage, Shiraz and Cabernet Sauvignon without giving proportions. 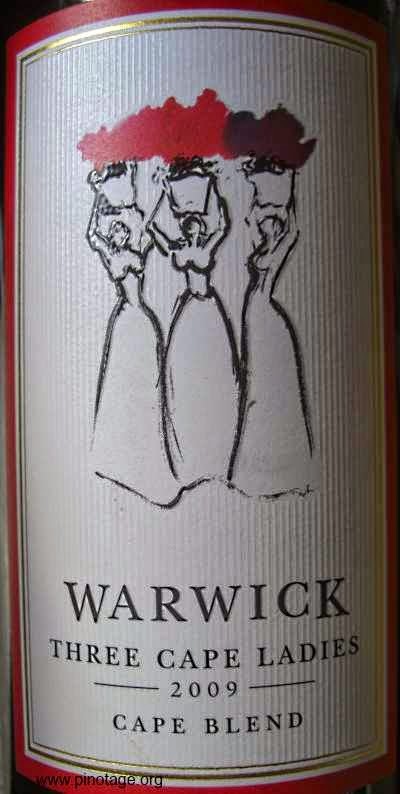 Warwick’s website has been redesigned and regrettably no longer carries fact sheets on past vintages. An online search is no help; different merchants list different constituents and proportions that often don’t total 100%. As always, I want a time machine so I can go back and buy more of this delicious wine. L’Avenir Estate has opened South Africa’s first lounge dedicated exclusively to Pinotage, located in the heart of the functioning cellar on the estate. The L’Avenir PINOTAGE LOUNGE invites enthusiasts of the variety to experience exclusive tastings hosted by the winemaker, Dirk Coetzee. Not only can the space be booked for intimate events & corporate functions, but offers the opportunity to taste & purchase rare older vintages dating back to the 1970’s. The lounge was officially launched on Thursday, 5 March. The evening began with tastings of the latest vintage of L’Avenir’s Single Block Pinotage 2013 out of barrel, the latest vintage under Dirk Coetzee, moving to the current release Single Block 2012 and ending with a selection of previous winemaker, Francois Naude’s favourite rare vintages. Francois Naude, winemaker at L’Avenir for 13 years from 1992 until 2005, is recognized as one of the original pioneers of Pinotage in South Africa and relished the opportunity to share his experience with the variety. L’Avenir Single Block Pinotage is made from a selected parcel of cultivated bush vines from what is known as Block 2 on the farm. This block is made up of vines ranging in age from 15 to 30 years old and has consistently produced exceptional quality fruit which, up until 2012, had been used in red blends. In 2012, it was decided to bottle the block as a single varietal, vinified to showcase the finest traits of the variety. The L’Avenir Pinotage Lounge is open during tasting room operating hours and for private functions. Bookings are essential.